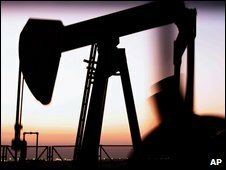 Crude oil's price has risen back above $50 a barrel for the first time in ten weeks, pushed higher by a weaker dollar and hopes of an economic upturn. US light crude gained rose to $52.25 before closing at $51.61 a barrel in New York trading. Oil has gained more than 15% since the start of the year. Oil gained after the US Federal Reserve announced a plan to buy $1.2tn (£843bn) of debt to boost its economy, which in turn may stoke oil demand. In London, Brent oil gained by $3.01to $50.67. The Fed's plan to buy up to $300bn worth of government debt as well as $750bn of mortgage-backed securities sent the dollar lower against all major currencies, as investors were concerned about the increase in the money supply. Some investors responded by putting their money in oil as a so-called safe haven from declines in other markets, analysts said.